Pilot Andre Boschberg (R) chats with pilot Bertrand Piccard after Boschberg landed "Solar Impulse 2" in Muscat, Oman, March 9, 2015. Solar Impulse2 - a solar-powered plane on a journey around the world landed at Ahmedabad airport in India late Tuesday, completing the second leg of its journey. The plane had taken off from Muscat, Oman, 16 hours earlier for the 1,465-kilometer (910-mile) portion of the flight. 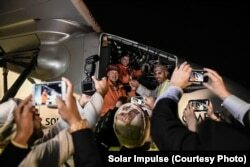 Swiss scientists Andre Borschberg and Bertrand Piccard began their global adventure Monday in Abu Dhabi. 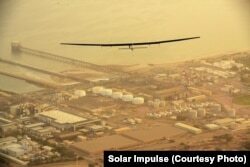 They plan to fly around the world using only energy harnessed from the sun. The wings of the Solar Impulse 2 are covered by more than 17,000 solar cells that recharge the plane's batteries. It flies ideally at around 25 knots, or 45 kph (28 mph). Piccard, who was the first to fly around the world in a balloon, said he and Borschberg were out to prove that alternative energy sources and new technologies can make the impossible possible. Si2 is slated to make 12 stops during its 35,000-kilometer (21,700-mile) journey, including in China and Myanmar, before it crosses over the Pacific Ocean. It will then land in Hawaii and the U.S. Midwest and East Coast before flying over the Atlantic Ocean. It may also stop in southern Europe or North Africa, depending on weather conditions. Some legs of the trip, such as over the Pacific and Atlantic oceans, will mean five days and five nights of flying solo. Both pilots have been training hard for this journey, which will span 25 flight days over five months. The Si2 aircraft has a wingspan of 72 meters (236 feet), larger than a Boeing 747 jumbo jet. At around 2,300 kilograms (5,070 pounds), the Si2 weighs about as much as a minivan or midsized truck. An empty Boeing 747, by comparison, weighs some 180,000 kilograms (400,000 pounds).